Back in 1957, brothers, Cyril and Louis Keller were approached by a local turkey farmer who had a problem. Could they think of a way of a way to get all of the turkey crap out of his barns in a more efficient way than the cumbersome front loader machine that they employed, as it wasn’t able to maneuver sufficiently around the space? The brothers thought long and hard, often arguing late into the night of how they could overcome this conundrum until they had their Eureka moment. The front loader was limited in its maneuverability - so if they were to add a rear caster wheel that was able to turn around within its own length, the problem is solved. And solved it was. So much so that another pair of brothers, the Melroses, who ran a manufacturing company in North Dakota, bought the rights to their design. The Keller brothers were also offered the chance to continue their work and try and improve on what they had already achieved. Which they did, with great success. At the end of 1958, the M-200 Melrose self-propelled loader was launched. Powered by a 12.9 horsepower engine it was equipped with two independent front-drive wheels along with a rear caster wheel and a 750-pound lift capacity. They continued the development and within a couple of years, the M-400 came to market, which was the first four-wheel skid-steer loader. That was soon upgraded to the M-440 with its 15.5 horsepower engine and a 1,100 lb lifting capacity. The skid loader seemed that it was here to stay, and for three decades, it did just that. Being highly versatile and with the ability to use different attachments it could (and still can) perform a range of tasks, from excavation and grading to demolition and debris removal to overhead work and lifting. Right along side the loaders were the small industrial Cummins, John Deere and CAT engines built for low end torque and handling heavy loads. Best of all, its compact size enabled it to be used indoors and in many other applications where larger equipment didn’t fit. A number of other major manufacturers produced their own models, including JCB, Caterpillar, Volvo, Hyundai and Whacker Neuson, growing bigger and more powerful in some cases - and more compact yet still more powerful in others. Takeuchi, a Japanese manufacturer of environmental equipment, established in 1963, outgrew their domestic market and by the advent of the 1970s were looking to go global and began buying up heavy machinery manufacturers around the world. One of their innovations was the world’s first compact excavator which at first was dismissed as being too ‘toy like’. Despite this, it quickly grew in popularity as its use of tracks, rather than wheels, gave it greater maneuverability. This led to the Compact Track Loader (CTL) which was very similar to the Skid Loader but, like the compact excavator, used tracks instead of wheels. Still, the Japanese are known to be perfectionists when it comes to manufacturing and it took seven years to complete market development and testing. This was not unusual as a Takeuchi business development manager explained. By this time Takeuchi had a presence in North America as they continued with their global plan and to get a foothold in the United States and in 1986 the Compact Track Loader arrived. Although the skid loader had come on leaps and bounds since its inception, it still had wheels, which made them very difficult to use in certain terrains, such as ice and mud. Over the following decades, the CTL became the choice loaders, superseding the skid loader, particularly in multi-terrain applications and in regions that experienced severe weather swings, and regions such as California, Texas and Florida, which have softer soil conditions. That’s not to say that the CTL doesn’t work well in any terrain - it does. Yet the skid loader still survives today. So why hasn’t it slipped into the graveyard of the obsolete along with the traction engine and the hog oiler? Perhaps one reason is that the CTL has become to be known as a machine that is capable of many tasks but master of none. But what other reasons are there for as to why the skid loader still survives today? Interestingly, though CTL sales have risen dramatically over the years, skid steer sales have held steady. The reasons behind this are multi-faceted. Firstly and perhaps most obvious is budget. CTLs are considerably more expensive than the Skid as are maintenance costs. Replacing tracks cost somewhat more than some wheels and an axle. Speed. The skid loader can travel at between 10-12 mph where the CTL can reach between 7-10 mph. Granted, speed isn’t required in many applications but in the ones that do, an industrial chicken barn, for example, it’s a case of time means money and on a large site an extra 5 mph when mucking out a giant chicken shed can save a lot of both. Another application where speed is key is lift and carry to different sites. In the modern economy, margins are becoming ever more important and every little bit helps. Another advantage is that the Skid works well and speedily on changing terrains, such as mud one minute, pavement the next. The CTLs are fighting back on speed though and the new generation of CTLs, such as those made by ASV can reach speeds of 11 mph. The downside for the Skid is where speed isn’t important, such as static operations with attachments which include concrete pumps, stump grinders, chippers and augers. But then on other applications such as recycling and waste and demolition or on severely uneven surfaces, due to the superior shock absorption and the ability to use different tyres, the skid steer again outperforms the CTL - as well as providing the operator with a more comfortable ride. Perhaps the greatest advantage of the skid steer over the CTL is when working on snow. The skid steer has much better traction so whether you’re ploughing it, pushing it or blowing it, you’re doing it more efficiently. 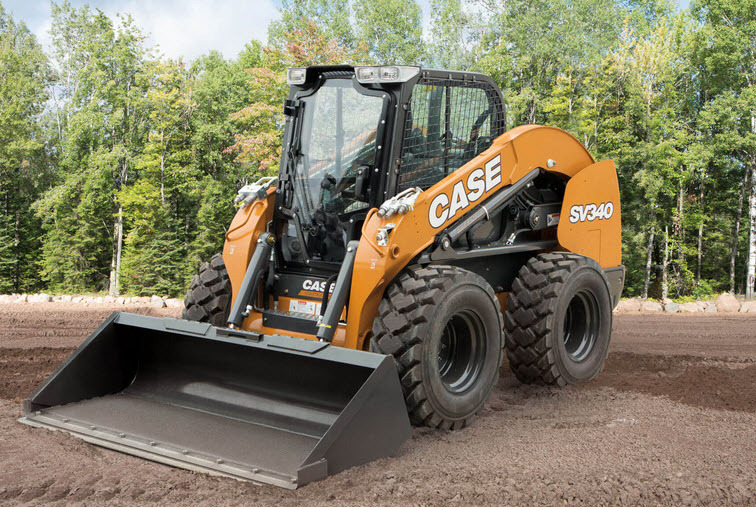 As much as 50% of the customer base buying skid steers use them for snow-based applications and with the world’s weather getting madder and madder, that’s surely good for skid steer manufacturers - though less good for the rest of us. And when there is no snow, they can be hired out to other industries that require a loader with incredible maneuverability abilities, such as tight spaces where the CTL simply couldn’t do the job. Counter rotation is a particular USP and though a CTL can do that maneuver, it will cause severe wear and tear. Maximum maneuverability is also key with applications that require precise positioning of attachments, such as breakers and sweepers. Industries such as demolition, agriculture, scrap, waste, recycling, mine and quarry also favor the skid steer by about 3-to-1. Of course, CTL manufacturers insist that anything a skid steer can do, a CTL can do as well as or better. Though not strictly true, it’s a fair point. However, his brings us back to cost. If the Skid Steer can do the job just as well and as quickly as a CTL but is cheaper, what’s the sensible choice? A CTL costs approximately 20% more than a skid steer but when you factor in fuel economy and maintenance costs that would add a further 10%. Tires, for example, are mass produced, whereas tracks are highly engineered therefore cost more. 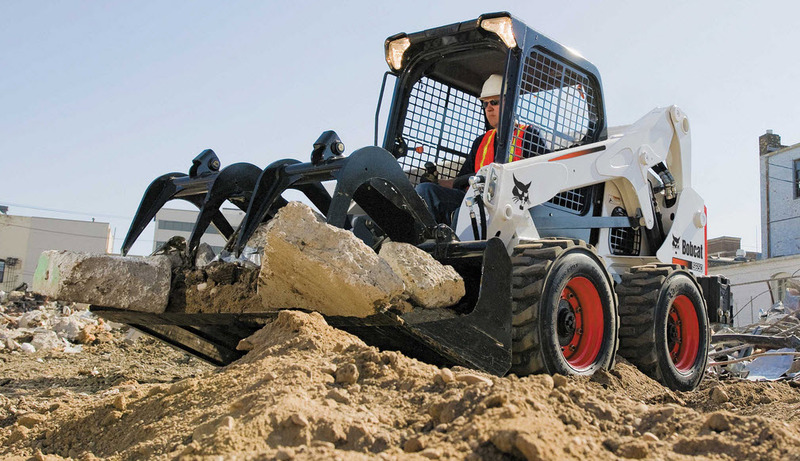 Skid steers are also a lot lighter, which also reduces transport costs. Passing that extra 30% on to the customer could be the difference between winning or losing a valuable contract. Even if the required application requires tracks the skid steer can also accommodate with the use of over-the-tire tracks (OTTs). Though that solution doesn’t come without a new set of problems as OTTs can collect rocks, scraps of lumber and other debris that may break tire beads and may even break a chain. The machine can walk out of its tracks on counter-rotation, especially with rubber tracks. That in mind, OTTs should probably only be seen as a solution for seasonal tasks. So what of the future? Skid steers are still getting bigger and better, the result of which is that the cost difference between the CTL is beginning to narrow, though are highly unlikely to ever reach parity. 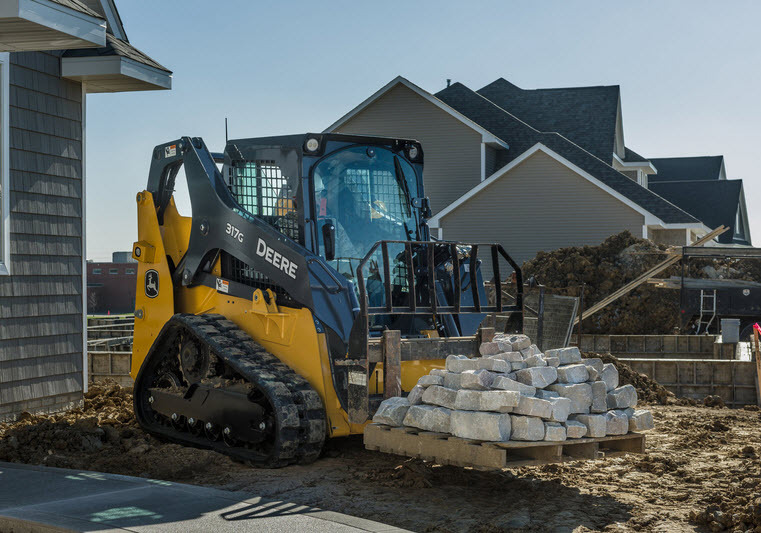 The CTL is still (relatively) the new kid on the block and is certainly a highly efficient machine which is easier to use and can outperform the skid steer on many levels. Then again, Apple says that about their phones but other manufacturers are still able to grab market share. Skid loader sales are booming again and the worldwide market is still over a billion dollars a year. Last year, over 25,000 units were sold in the US alone. A part of the reason for this is the massively growing recycling industry where the skid loader is the machine of choice, for both its maneuverability and its versatility. Its versatility is becoming as much a USP as its maneuverability as more and more people are discovering the wide range of attachments that the Skid loader can accommodate. As businesses are looking for more economical ways to get the work done, the skid loader is perfect. Use a grapple, pallet fork or a bucket for recycling applications then switch to a broom attachment to clean up the area, for example. Why buy single-use equipment when the skid loader has muti-uses? It's easy to see why so many skid steers and CTLs used Cummins 4BT Engines in them for their reliability as well as low end torque to get job done at all kinds of job site? Durability is a third USP as the skid loader market proves, with the sales of used units only a few percent below the sale of new ones. To sum up, the skid steer may have taken a hit from the more modern CTL but it's fighting its corner and the future remains bright. Not bad for a bit of machinery invented to clear up some turkey crap.